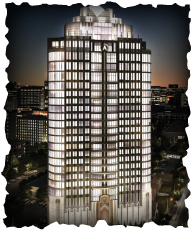 Astoria luxury high rise is another project of Randall Davis and is 28 stories, with only 74 condo units and ten exclusive Penthouses with extra large terraces. The luxury penthouses also two master baths feature maid's quarters. Enjoy the breathtaking views of the Galleria and Downtown. Amenities include: Controlled Access | 24/7 Concierge | Private Elevator Entries | Infinity Edge Pool | Guest Suites | Fitness Center | Wine Room | Movie Theatre | Available Storage Units | Assigned Parking | Penthouses have Private Garages.